When searching for property you are subconsciously ticking off your checklist. Property type, building material and location are usually the top of anyone’s list. You will be pleased to find that 26 Finlow Drive will generate three ticks. Positioned on a freehold 352m2 (approx.) 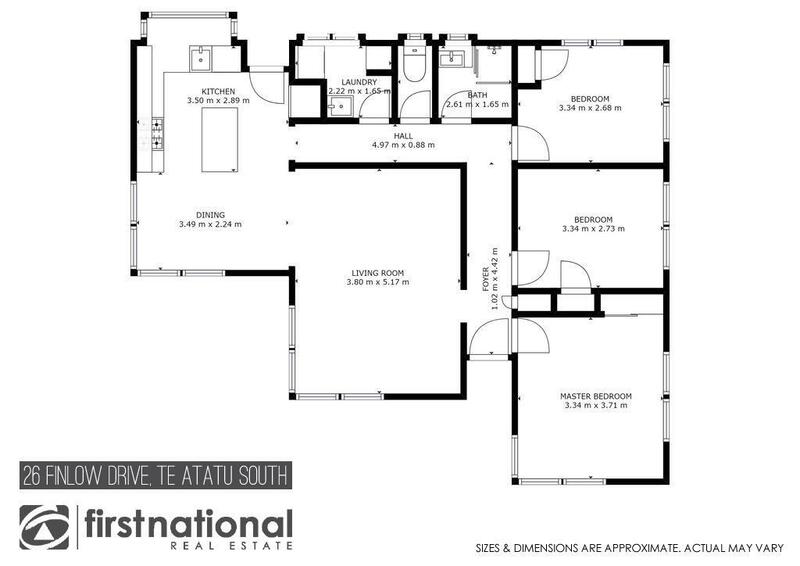 site, constructed with brick, topped with tile and located in the convenient and popular Te Atatu South. This property is sure to impress with its timber floors, neutral tones and modern fixtures throughout. The hub of the home comprises of a spacious and sun-drenched lounge which leads through to the open plan dining and kitchen. The kitchen is sophisticated and functional, combining black tapware and a tiled splashback with practical bench space and ample storage. The remaining floor area consists of three generous bedrooms, family bathroom, additional separate toilet and a separate laundry. Stepping down through the back door is the deck, equipped with inbuilt seating making it the ideal spot for summer entertaining. The private back yard also houses the garden shed, clothesline and a raised garden bed. This area is fully fenced providing a secure space for children and pets. Well situated, this property is within a ten-minute drive to all amenities. It is in zone and within walking distance to Tirimoana Primary School and only a five-minute walk to the closest bus stop for public transport. The last time this property was on the market it was snapped up quick so don’t sit back and wait because it won’t last long this time round. Contact Tash for further information or to arrange a private viewing. Property documents are available upon request.